Lower margins and poor weather finally had an impact on EU and Oceania farms this summer. Over the three-month period from June-August, global milk supply and demand began the slow process of rebalancing. Milk production for the top five dairy suppliers (Argentina, Australia, the European Union, New Zealand and the United States) fell 1.3 percent. Export volume from those same suppliers grew 6.5 percent over the same period. Against that backdrop, international commodity prices rose sharply by 30-40 percent, notwithstanding heavy global stockpiles. But the rally has stalled, even as farmgate milk prices creep higher. For best clarity on mobile devices, view the chart below horizontally, in landscape mode. Lower margins and poor weather finally had an impact on the farm this summer. Of the five major dairy suppliers, only the United States increased milk production over the June-August period. 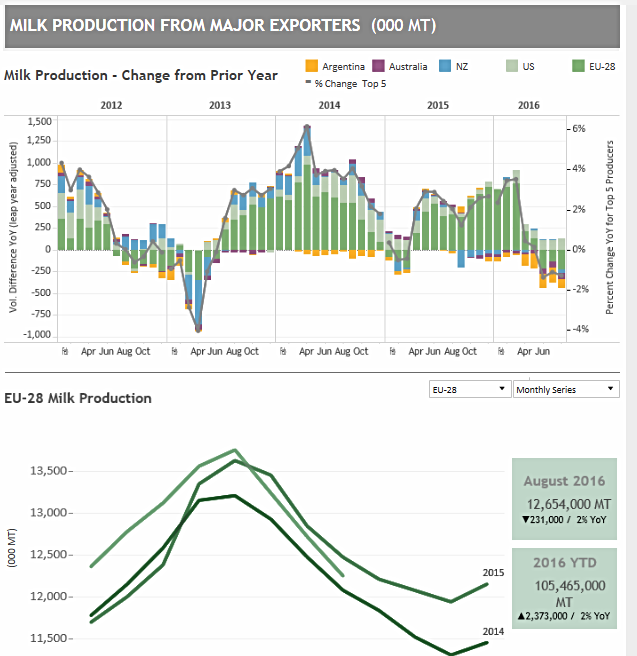 Conversely, aggregate June-August milk production from Argentina, Australia, New Zealand and the European Union (EU) declined 2.7 percent compared to the previous year. The EU was the responsible for 46 percent of the volume reduction. The EU predicts its second-half 2016 milk output will fall 2 percent (about 1.5 million tons) compared to the previous year, but part of that decline is predicated on farmers utilizing the bloc’s voluntary milk production reduction scheme, which pays farmers to make less milk. EU farmers subscribed in droves to the plan, which was budgeted to slash EU milk output by more than 1 million tons. But subscribing does not oblige farmers to implement the cutbacks. And pre-quota-removal investments in processing capacity in key EU dairy states like Ireland and the Netherlands incentivize milk processors to lift prices to ensure a steady milk flow and maximize operating efficiency. Irish and Dutch milk collection, in fact, have largely continued to rise in the face of oversupply. New Zealand similarly projects a decline in milk output over the coming months. For the full 2016/17 year, analysts expect production to fall 3 percent. But with farmgate prices rising, should the rain-drenched North Island get consistent sun through the spring flush, output would likely outperform current forecasts. Many—but not all—farmers in the EU and Oceania insist they remain in a state of crisis, focused on cutting expenses rather than investing to expand. But as commodity prices firm, the higher milk prices and payout forecasts seen in Europe and Oceania will likely soften the rate of contraction that might have otherwise occurred. A slow supply correction means there’s still too much milk for the current level of global demand. Editor's note: The analysis on this page is based on data available on October 24. Chart: Has Global Milk Production Turned a Corner?